It's a tale of extremes, but plenty of people in Southern California have their own travel stories after a jam-packed holiday season. But could a new kind of travel insurance ease that kind of suffering? It's a new program that promises to put cash in your pocket quickly — next time your flight plans go haywire with issues such as endless delays, missed connections, and lost bags. Before now, an airline might give you a free ticket or extra miles for your troubles, or replace your lost clothing. Certain travel insurance companies will pay damages after you submit lots of paperwork. But a new company called AirCare, a subsidiary of Berkshire Hathaway, is offering more immediate protection. If you pay $25 per ticket, when certain mishaps occur, AirCare will deposit money into your PayPal or bank account. If your flight's delayed more than two hours, you get $50. If your checked luggage is delayed more than 12 hours, you get $500. Luggage that's lost or stolen gets you $1,000. Same goes if you're stuck on the tarmac for more than two hours. But as great as this sounds, a travel agent says the insurance may not be worth it. "Insurance is a gamble. You don't really want to use it," said Tama Holve, of the Willett Travel Agency. "What concerns me about this is that people will get this instead of other products that are more encompassing for various reason." There are policies from $29 to $86 that are age-based and they would include almost everything except tarmac delay, but they would also include emergency medical evacuation and primary medical expenses, she said. "So I want people to look at this as possibly a great deal but also look at what else is out there," Holve said. While AirCare provides quick reimbursements in certain cases, you might be better off signing up for traditional travel insurance, which will take longer to compensate you, but cover problems that AirCare doesn't — such as flight cancellations. 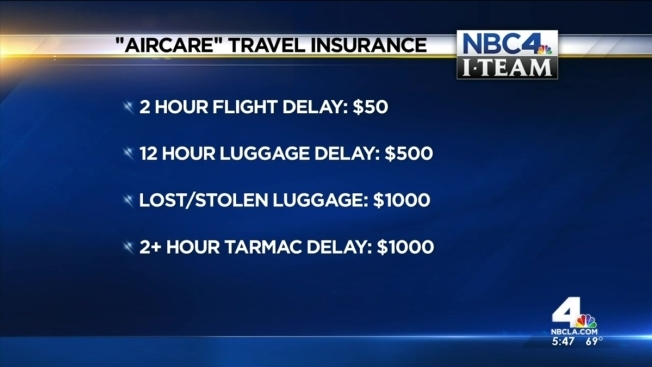 One more thing to keep in mind: AirCare only covers domestic travel. But company officials said they plan to expand coverage to international flights.